What we love most about the article is its focus on resistance training for major muscle groups. They do provide some great tips and the article is worth a read, but we do have one addition and it’s not just for aging, it’s overall health for all! We’d like to see much more emphasis and creativity on upper body workouts, which can offer an amazing way to build aerobic capacity and upper body strength, burn calories, and build core stability. Often times when we think of wanting to burn calories or build muscle, we go right for exercises that impact the Gluteus maximus (glutes) because it’s the largest muscle in the human body. But, a very close second is the bilateral latissimus dorsi muscles which are your “lats” and one of the widest muscles in the human body. So, we can’t forget to put our “lats” to work, especially after keeping our upper body confined all day working at a keyboard or holding our phones with our arms in a Tyrannosaurus rex position! Your upper body needs the same attention as your lower body and vice versa. Whether young or older, people are often shocked at the amount of calories they can burn and toning that can be done by using Excy for upper body rotational and cranking exercises. 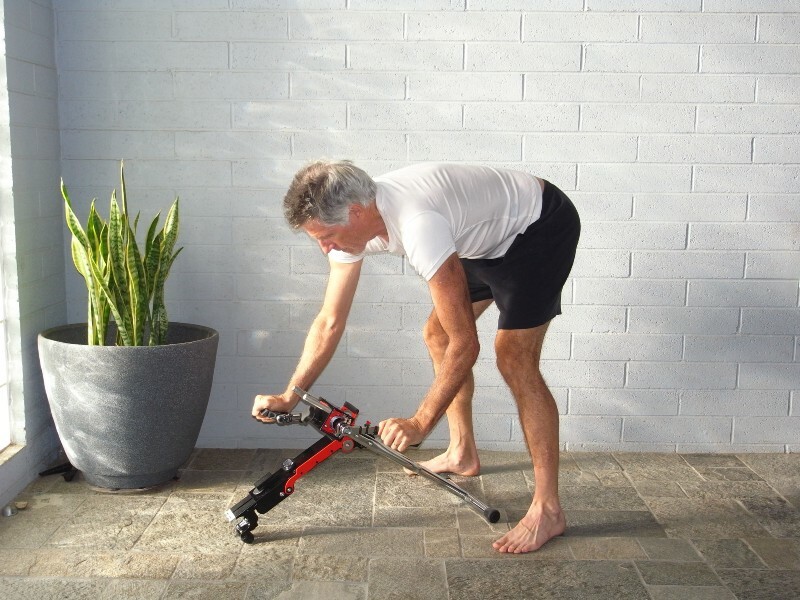 The existing apparatus for this type of exercise, the Upper Body Ergometer (UBE), has predominately been viewed as something used for rehabilitation, not exercise or strength training. In addition, getting a quality experience often requires a trip to the gym, a physical therapy clinic, or a large piece of equipment people might not have room for in their home. So, the benefits of UBE exercises have largely gone unknown and are underutilized. However, a study published in the October 2010 issue of the “Journal of Strength and Conditioning Research” found that the arm crank, or bike, was as effective at measuring physical fitness as a bicycling ergometer. Not only was this great news for people who are temporarily or permanently disabled, but it also demonstrated that an upper body rotational exercise can be a fast power workout for the upper body and core, and a great way to retain cardiovascular fitness when our legs can’t be used or need a rest. Lightweight, compact, and transportable, Excy weighs 10 pounds and offers 30 pounds of bi-directional resistance for spinning, cranking, pushing, and pulling with arms and legs. Plus, it’s just downright fun, doesn’t require planning, and you can’t beat the convenience. We already know that regular physical activity like exercise cycling might cut Alzheimer’s risk, so the Huffington Post article is great for highlighting some of the best exercises we can do while aging. We just want to add resistance based upper body rotational and arm cranking exercise to the mix for all! Check out some of our upper body workouts!